Home → News & Articles → NRA Show Exhibitor Set-ups a Trade Show Booth Offering Sustainability, Savings and a Green Message! 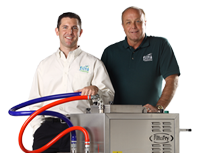 Filta Environmental Kitchen Solutions, a newly re-branded company, will have a booth at the NRA Show for the first time since the company was founded. The business re-branded itself as the Environmental Kitchen Solutions partner in the late part of 2008. A worthy tag, since the business consists of FiltaFry, the undisputed market leader in oil-filtration & deep fryer management, and FiltaCool, a unique natural filter for moisture control. Both products are proven to save customers money and increase sustainability. There is much more to learn about this unique business, from customer success stories, and franchise opportunities, to product and service benefits. If you were not scheduled to drop by Booth number 1981, now is your chance to re-consider and learn about the country’s newly branded Environmental Kitchen Solutions partner, Filta. 50 million – Pounds of oil filtered by Filta annually. That’s the equivalent of over 750,000 barrels of oil. 250 million – yes, that’s 250m! Pounds of oil filtered to date by Filta. That volume of oil would take up 25,000,000 cubic feet… it would fill a sports stadium.